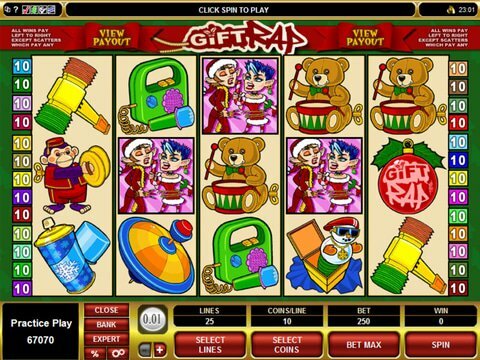 Playing Gift Rap will make you think of the holiday season and the world of hip hop with all the toy symbols in the game, which features 5 reels and 25 paylines. You can win as much as $30,000 on a single spin and wager as much as 250 coins per spin. Low stakes players and high rollers and low stakes players alike will enjoy the game with a betting range from 1 cent to $125. If you are looking to enjoy this free slot machine here, you can without the hassle of downloading. There are no free spins or multiplier in the game, but there is a wild and scatter symbol and a bonus game. Play the Gift Rap slot machine at most Microgaming casinos. The symbols in Gift Warp include a couple of elves, a jack in the box, a snow spray can, the Gift wrap log, and a few toys. The Gift Rap logo is the wild and the snow spray can in the scatter, which can increase your win depending on how many of the symbols you hit and your bet for that spin. You will trigger the bonus game by spinning on 3 or more of the jack in the box symbols. In the bonus game you are given the choice of gifts to unwrap and every gift has a sweep payout. The graphics in Gift Rap are solid and the sounds are more like Christmas themed rap songs. There are 2 unique features in the demo mode, where you can play the game for free, and the expert mode, where you can take advantage of the autospin feature. If you are a Canadian player, you can visit the no deposit Jackpot City Casino. Within our review, you will find a $10 no deposit bonus, and learn that the site will give you 100% up to $500 on your first 2 deposits.